In October 2017, the Department of Health and Human Services (HHS) declared a public health emergency to focus on the opioid crisis. Analyzing data from 2000 to 2015, HHS estimated that 91 Americans had died of opioid overdoses each day, and the numbers have increased. It's been preliminarily reported that at least 64,000 died of the same cause in 2016. While the nation continues to focus on the sheer number of opioid drug overdoses, many may not know how HIM professionals play a key part in the fight against what is now the leading cause of injury deaths in the United States. In response to HHS declaring the opioid epidemic a public health emergency, AHIMA recently released a documentation tip sheet that introduces seven characteristics of high-quality clinical documentation related to opioid use and abuse. These characteristics, while important when documenting all patient records, are especially important for tracking the specifics of opioid use. • Legibility. Although we are living in the digital age, not every facility or provider has migrated to an EHR. When provider documentation is illegible, it affects not only the accurate coding of an encounter but also patient care. If a patient is being treated for a condition and any piece of diagnostic documentation is illegible, treatment could be jeopardized. • Reliability. A 65-year-old male patient has a follow-up visit for COPD. The provider documentation mentions that the patient is being treated for the COPD and he should continue his methadone therapy. However, there is not a diagnosis anywhere in the record that correlates with the methadone therapy. As a result, the patient's record would be considered unreliable. By adding a diagnosis of OxyContin addiction, the reliability characteristic would be met. • Precision. According to Pamela Carroll Hess, MA, RHIA, CCS, CDIP, CP, author of Clinical Documentation Improvement: Principles and Practice, a precise record is one that is accurate, exact, and strictly defined. The more details a provider can document about the patient's condition, treatment, and patient-provider interaction, the more precise the record will be. A diagnosis of drug abuse without documenting the type of drug that is being abused is a perfect example of imprecise documentation. • Completion. Complete documentation is imperative to ensure the patient's continuity of care. Providers must not only offer topnotch documentation to guarantee the completeness of the medical record, they also must authenticate every entry with their signature and date. When a provider documents that the patient had abnormal laboratory findings related to a drug screening but fails to document what those findings were, the record is considered incomplete. • Consistency. For a record to be considered consistent, there should be no conflicting documentation. For example, suppose the attending provider documents "39-year-old male patient was admitted for opioid use. This is the second admission for opioid abuse in the last two weeks for her." Is it opioid use or abuse? Is the patient male or female? Even little details matter for consistency. • Clarity. Clear documentation means leaving no room for interpretation and being as informative as possible. For example, a provider knows his patient, admitted with fatigue and lethargy, is addicted to heroin but fails to document the addiction. This leads to ambiguous documentation and can possibly be detrimental to the patient's continued care. • Timeliness. Providers' schedules are demanding—many see dozens of patients every day. These demands create a time crunch, with documentation often becoming a lower priority. However, if a diagnosis or a treatment is not documented, the patient is put at risk. EHRs relieve some of the documentation burden, with providers frequently carrying an electronic device while rounding or seeing patients. Nevertheless, timely documentation remains a problematic issue. These seven characteristics should be present in every entry in a patient's health record, regardless of diagnosis. Documentation that does not meet each aspect of these characteristics can lead to inadequate patient care. While we do not want any patients slipping through the documentation cracks, patients experiencing opioid use, abuse, or dependence are particularly vulnerable. • if both use and dependence are documented, assign only the code for dependence." There is a difference when "abuse" or "use" is documented as opposed to "dependence." For a coding professional to capture the true reason for the admission and code accurately, providers must document whether it was use, abuse, or dependence. • T50.901A, poisoning by unspecified drugs, medicaments, and biological substances, accidental (unintentional), initial encounter. • F19.90, other psychoactive substance use, unspecified, uncomplicated. 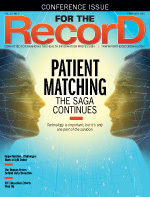 With a few more precise words documented, the patient's record would be coded differently. For example, a 25-year-old male was admitted to the emergency department with an accidental heroin overdose. He has been opioid dependent for three years. • T40.1X1A, poisoning by heroin, accidental (unintentional), initial encounter. • F11.229, opioid dependence with intoxication, unspecified. A 57-year-old female is seen by her primary care provider for a follow-up related to cirrhosis. The provider documented a history of alcohol and drug abuse with cirrhosis. These diagnoses are lacking clear, complete, and precise documentation. • K74.60, unspecified cirrhosis of liver. • F10.11, alcohol abuse, in remission. • F19.11, other psychoactive substance abuse, in remission. When the provider delivers more precise documentation, the codes change and the patient receives a much more complete diagnosis. A 57-year-old female is seen by her primary care provider for a follow-up related to cirrhosis. The provider documented a history of alcohol dependence and heroin abuse with alcoholic cirrhosis. • K70.30, alcoholic cirrhosis of the liver without ascites. • F10.21, alcohol dependence, in remission. • F11.11, opioid abuse, in remission. Without accurate documentation, patients who deal with opioid abuse may suffer or not receive the care they need. When patients are transferred between facilities, some conditions may be lost in translation if not documented appropriately, which potentially can put the patient in harm's way including life-threatening situations. No one should have to worry about documentation errors that, if avoided, can help ensure opioid users receive the care they need. It is up to HIM professionals to create solutions to this issue, helping to reduce the opioid crisis one patient at a time. — Angie Comfort, RHIA, CDIP, CCS, CCS-P, is senior director of HIM Practice Excellence for AHIMA. In her role, she provides professional expertise on coding practice issues to AHIMA members, the media, and outside organizations. She authors material for and supports AHIMA online ICD-10 coding education platforms, serves as faculty for the AHIMA ICD-10-CM/PCS Academies and CDIP Exam Preps, and is a technical advisor for the Association on ICD-10-CM/PCS, CPT coding and clinical documentation improvement publications.